Students studying integrated strategic communication learn to communicate creatively and persuasively to build mutually beneficial long-term relationships between organizations and their publics. Coursework in the program emphasizes theoretically grounded, data-based decision making to problem solve and innovate. With hands-on projects and internships, the highly flexible program gives you all the tools you’ll need to become a professional communicator-and the freedom to focus on what interests you. Most courses are taught in person by faculty and professional experts affiliated with the Edward R. Murrow College of Communication, while others are delivered from WSU Pullman via interactive video and the nationally ranked WSU Global Campus. Integrated Strategic Communication at Everett is a degree completion program designed to integrate with the state of Washington’s Direct Transfer Agreement (DTA) associate of arts degree. While an associate’s degree isn’t required for admission, it is highly recommended. Prospective students should complete enough of the Washington State University general education (UCORE) requirements to qualify for junior standing before enrolling. 1. 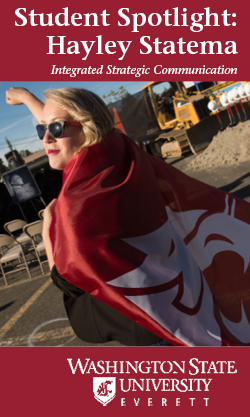 Apply for admission to WSU Everett using the Transfer Student Application. -Select “WSU Everett” as your campus and the “Integrated Strategic Communication” as your academic interest. 3. The academic coordinator will contact you and help you apply for certification into the Integrated Strategic Communication program. NOTE: This deposit is nonrefundable; pay the deposit only after you are certified into the Integrated Strategic Communication program. Complete the WSU scholarship application by January 31. File the FAFSA by January 31 to qualify for scholarships that consider financial need. The Edward R. Murrow College of Communication at WSU awards scholarships to students interested in broadcasting, journalism, public relations and general communications. The Edward R. Murrow College of Communication is highly regarded nationwide and ranked first in the Northwest for its public relations sequence.